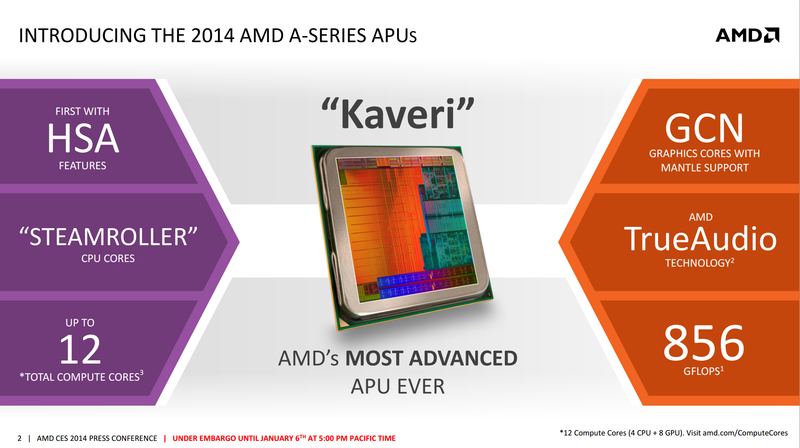 On the back of AMD’s Tech Day at CES 2014, all of which was under NDA until the launch of Kaveri, AMD have supplied us with some information that we can talk about today. For those not following the AMD roadmap, Kaveri is the natural progression of the AMD A-Series APU line, from Llano, Trinity to Richland and now Kaveri. 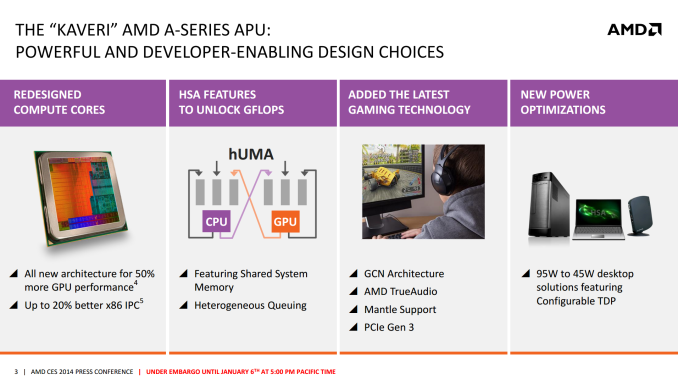 At the heart of the AMD APU design is the combination of CPU cores (‘Bulldozer’, ‘Steamroller’) and a large dollop of GPU cores for on-chip graphics prowess. Turbo 4200 MHz 4400 MHz ? ? Manufacturing Process 32nm 32nm ? ? 4 x 16 KB D$ ? ? L2 Cache 2 x 2 MB 2 x 2 MB ? ? All the values marked ‘?’ have not been confirmed at this point, although it is interesting to see that the CPU MHz has decreased from Richland. A lot of the APU die goes to that integrated GPU, which as we can see above becomes fully GCN, rather than the Cayman derived Richland APUs. This comes with a core bump as well, seeing 512 GPU cores on the high end module – this equates to 8 CUs on die and what AMD calls ’12 Compute Cores’ overall. These GCN cores are primed and AMD Mantle ready, suggesting that performance gains could be had directly from Mantle enabled titles. 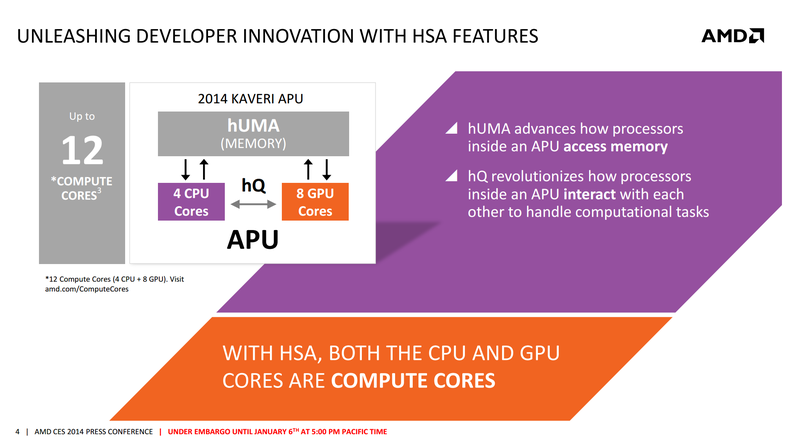 Described in AMD’s own words: ‘A compute core is an HSA-enabled hardware block that is programmable (CPU, GPU or other processing element), capable of running at least one process in its own context and virtual memory space, independently from other cores. A GPU Core is a GCN-based hardware block containing a dedicated scheduler that feeds four 16-wide SIMD vector processors, a scalar processor, local data registers and data share memory, a branch & message processor, 16 texture fetch or load/store units, four texture filter units, and a texture cache. A GPU Core can independently execute work-groups consisting of 64 work items in parallel.’ This suggests that if we were to run asynchronous kernels on the AMD APU, we could technically run twelve on the high end APU, given that each Compute Core is capable of running at least one process in its own context and virtual memory space independent of the others. The reason why AMD calls them Compute Cores is based on their second of their four pronged attack: hUMA. Now that Kaveri offers a proper HSA stack, and can call upon 12 compute cores to do work, applications that are designed (or have code paths) to take advantage of this should emerge. One such example that AMD are willing to share today is stock calculation using LibreOffice's Calc application – calculating the BETA (return) of 21 fake stocks and plotting 100 points on a graph of each stock. With HSA acceleration on, the system performed the task in 0.12 seconds, compared to 0.99 seconds when turned off. AMD is wanting to revolutionize the way that games are played and shown with Mantle – it is a small shame that the Mantle release was delayed and that AMD did not provide any numbers to share with us today. The results should find their way online after release however. With Richland we had CPUs in the range of 65W to 100W, and using the architecture in the FX range produced CPUs up to 220W. Techincally we had 45W Richland APUs launch, but to date I have not seen one for sale. 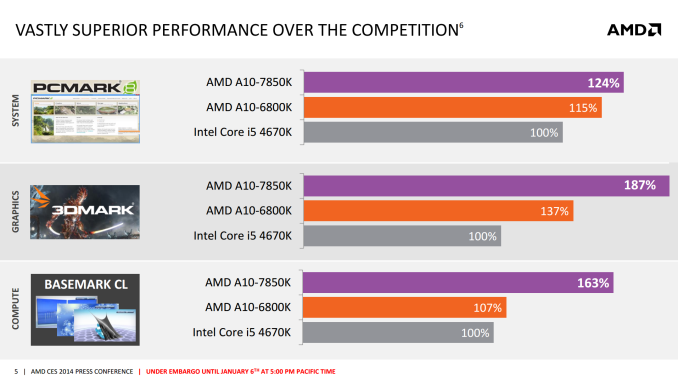 However this time around, AMD are focusing a slightly lower power segment – 45W to 95W. Chances are the top end APUs (A10-7850K) will be 95W, suggesting that we have a combination of a 20% IPC improvement, 400 MHz decrease but a 5% TDP decrease for the high end chip. Bundle in some HSA and let’s get this thing on the road. AMD have given us the release date for the APUs: January 14th will see the launch of the A10-7850K and the A10-7700K. 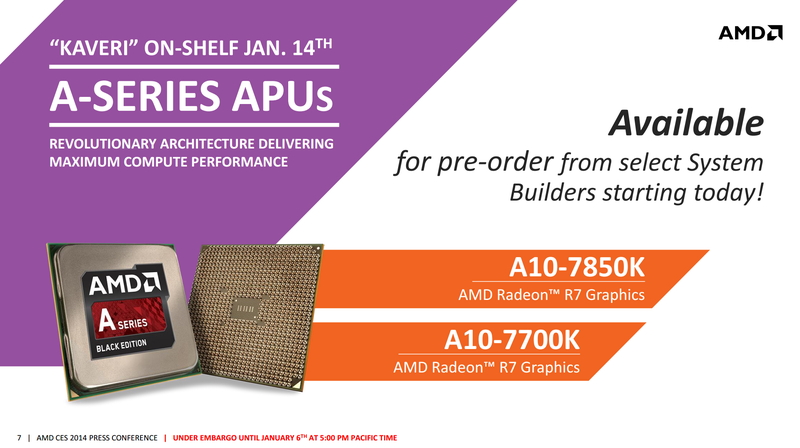 Certain system builders should be offering pre-built systems based on these APUs from today as well. Keep in mind that this is LibreOffice Calc, which is horrifically slow. So slow the developers will pretty much be the first people to tell you that it's too slow. As such I can totally believe that Calc really that slow right now.